Kanger K-KISS is an elegant vaping kit with 6300mAh built-in battery and 4.5ml e-juice capacity. 4 colors. 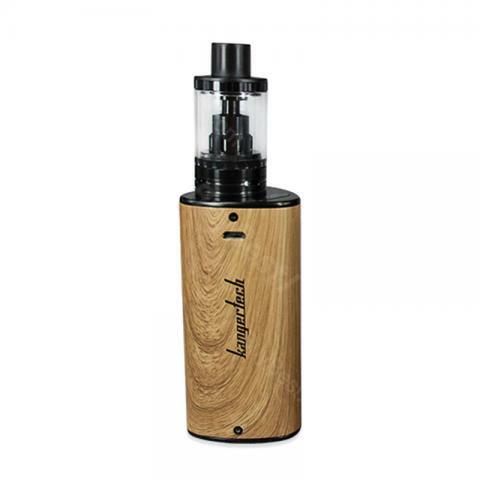 Kangertech K-KISS Starter Kit is a powerful vaping device with a 6300mah built-in battery and 4.5ml e-juice capacity. Users can enjoy a longer time vaping without troublesome charging and refilling. The K-Kiss supports a full power output just like a mechanical mod. It also features a new symmetrical airflow design, easy top filling, SSOCC coils and a replaceable pyrex glass tube. With a durable finish, you will have an excellent and comfortable grip. Available in 4 colors. • 5 speedy clicks on fire button to switch on/off. • Once switched on the battery, top LEDs will flash and show battery level. 5 LED lights up when fully charged. • LED lights on when press the fire button, lights off when switched off and atomizer will stop function. • LED will flash 3 times when when atomizer resistance value is less than 0.15ohm or short circuit. • Battery will stop function automatically when 10s overused and LED flashes. • LED will flash 15 times and stop functioning when battery is drained out. • LED will flash 6 times when PCB is overheated. • LED lights will flash while charging, and stops once fully charged up. am really pleased with the product and Vapor Authority customer service. I received the unit and almost immediately messed it up by accidentally burning out the coil. I emailed Vapor Authority after hours but they answered quickly. I am new at this and they got me going. So happy I chose this “full power” unit. So easy to use and take care of for an amateur like myself. No fuss and loads of vapor!! Very happy to buy this Kangertech K-KISS Starter Kit! really worth it! Alles ohne Nikotin, ich finde Kangertech K-KISS Klasse. Hat mich jedoch nicht von der Nikotineinnahme abgehälten.